04.05.2014 - 3/4 Placement match: The Macedonian champions bow out from the tournament on a high note after beating FC Midtjylland 34:31. 04.05.2014 - 3/4 PLACEMENT MATCH PREVIEW: Midtjylland might have the edge before the game as the Danish side will not have as many things to get over as Vardar players. 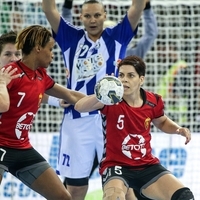 03.05.2014 - MATCH REVIEW: The big Balkan derby at the MVM EHF FINAL4 had to be decided over 70 minutes after Montengrin team survived two comebacks of Macedonian champions.